It's time for Believers to come out of their prayer closets and into the streets as carriers of God's presence. It is possible to change the atmosphere with our praises (1 Sam 16:23; Acts 16:25). It is possible to silence the voice of the enemy with the sound of worship. As we face continual threats, not only as a nation, but as local communities, let us not forget the power of God's presence to disarm the enemy's threats and shift the atmosphere towards Kingdom purposes. Jon Quesenberry is the Director of the Charlottesville House of Prayer. He and a small band of twelve intercessors took to the streets on the day of the rally, positioning themselves between the gathering demonstrators, and began to sing and worship. Being alerted three weeks earlier about the rally, they had already been covering their city in prayer. Quesenberry had also been prompted by the Holy Spirit through a dream which revealed the schemes of the enemy to bring violence to the city and how to stand in the gap for their community. The rally was to start at 1:00 p.m. (the protesters were going to start early at noon). 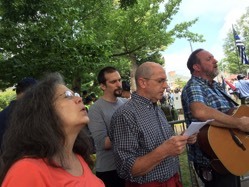 The group of intercessors took their position from 10:00 – 11:30 a.m. as demonstrators began to take their positions on either side of the barricades. As they started to sing and worship, Quesenberry describes what happened: "Worship silenced both groups for about an hour! We saw what public worship and prayer (declarations in partnership with Heaven) can do. The most amazing thing is that we had an assignment from the Lord that was 'counter protest.' We brought a different atmosphere. Both groups backed away from us and neither group knew what to do with us. It really did stop the momentum of the hate (shouting) for almost an hour." Quesenberry describes his strategy as a "worship and prayer circle." He says "...without the worship we would have been unable to maintain a prayer presence here because the noises around us were so distracting ... the protesters began to yell at us, ‘Hypocrites! Hypocrites!' and they began to chant against us, but they couldn't overcome the worship." He said that even the police began to back away from the group because they knew the area was safe. They later found out that their worship could be heard from a block away. View a short NBC 29 news clip of the worship by clicking here. It was only ten minutes after his group felt they should leave, that the rally was declared "unlawful" by the police and the demonstrators were given five minutes to disperse. Not only was the gathering dispersed, but none of the white nationalist speakers ever got to speak. He said the few skirmishes that happened are the ones repeatedly being replayed on newscasts giving the impression it was much more extensive. He also noted that though there were several fights reported elsewhere, there were none where his group of intercessors stood. There was one tragic death in the street (as the crowd was dispersing) and another two officers that were killed in a related helicopter incident. Twenty-three people were reported to have gone to the hospital for treatment of injuries. Yet, Quesenberry said the local hospitals had been prepared for hundreds to be injured and many possibly killed. He believes that the completed prayer assignment from the Lord and other small prayer groups of intercessors and pastors throughout the city, is what averted much greater violence in Charlottesville on Saturday. Quesenberry, a local resident, believes that over ninety-five percent of the participants were from out of town. Not only that, but almost half of the participants were from out of state. He believes his city simply became a staging place for these agitators who were looking for a place to promote their agenda. From what he saw on the streets that day, he says the issues we face are much deeper than political ideologies and racial differences. We are involved in a continually escalating clash of cultures in our nation right now. That clash is not one side "haters" and the other side "lovers." It's not that at all. What I saw at the rally is two types of haters because there were terrible things being said by the protesters, but ... it was the same coming from the counter-protesters. They were shouting things that should never be said to anybody ... there were fighters on both sides. There is no message that is going to overcome the divide between the clash in our nation. Education and empathy are not going to increase capacity for people to love one another. What's purely needed now is spiritual awakening and it starts with mass repentance. Quesenberry believes we have to repent "...not because we've done stuff wrong, but because we are a nation of sinners." He references Isaiah 6:5 where the prophet says, "I am a man of unclean lips, and I live among a people of unclean lips." It's this kind of repentance that identifies with the collective sin of a nation that has power in the Courts of Heaven to change things. Based on his observations, it would seem to confirm that these clashes are not simply the result of race wars or party differences. They are the result of sin and the absence of God's presence. Without the tangible presence of God covering and overshadowing His people, we will always be prone to war with one another. As Believers in Christ, our greatest demonstration to the world is our love, not just for one another, but for the One who reconciles all things to Himself (Col 1:20; Eph 2:16).